Â£75 million to a Russian billionaire.Plan to invest in the club NOT take over. Here is abit more on him click here. David Dein, the club's former vice-chairman and a close ally of manager Arsene Wenger, has called a press conference for 5pm this afternoon to spell out his future in football.While it is unclear exactly what Mr Dein will say, there has been plenty of speculation that Mr Dein could announce a sale of his 14.6pc stake in the Premiership club.Stan Kroenke, the US tycoon who has already been linked with a potential takeover of Arsenal after building up a 12.19pc holding in the club, was one of the names cited as a potential buyer of Mr Dein's shares.advertisementCombining Mr Dein's stake with his would take him close to the level at which he would be obliged to launch a full takeover bid.Boris Berezovsky, the Russian billionaire, was also mentioned as a potential purchaser of Mr Dein's stake. But Mr Berezovsky's representatives dismissed speculation that he was involved in any such moves. Arsenal in focus as David Dein calls press conferenceBy Ben BlandLast Updated: 3:50pm BST 30/08/2007David Dein, the club's former vice-chairman and a close ally of manager Arsene Wenger, has called a press conference for 5pm this afternoon to spell out his future in football.While it is unclear exactly what Mr Dein will say, there has been plenty of speculation that Mr Dein could announce a sale of his 14.6pc stake in the Premiership club.Stan Kroenke, the US tycoon who has already been linked with a potential takeover of Arsenal after building up a 12.19pc holding in the club, was one of the names cited as a potential buyer of Mr Dein's shares.Combining Mr Dein's stake with his would take him close to the level at which he would be obliged to launch a full takeover bid.Boris Berezovsky, the Russian billionaire, was also mentioned as a potential purchaser of Mr Dein's stake. 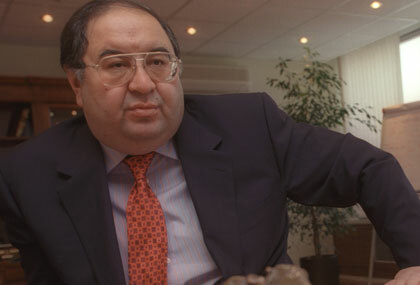 But Mr Berezovsky's representatives dismissed speculation that he was involved in any such moves. LONDON, Aug 30 (Reuters) - Former Arsenal Vice Chairman David Dein has sold his 14.5 percent stake in the UK soccer club to a firm co-owned by Russian billionaire Alisher Usmanov for 75 million pounds ($150.6 million).The announcement on Thursday by the firm Red and White Holdings Ltd puts further pressure on the board to face an eventual takeover. Red and White said it wants to increase its stake and would approach the board shortly, but has no immediate plans for a full buyout. Of course he does, they pushed him out of his dream job. The plot increases. Dein has always wanted to become chairman and he MAY end up getting his dream.